Over the last year and a bit there have been more and more places serving up English breakfasts. If you have ever had one then you know that it’s basically a hearty meal which often tends to have lots of meat and includes items like blood pudding, potatoes, and anything that would pass as a morning pub food. A large terrace in the summer greets you, and once you walk in, you see a large bar to your right, two floors of seating and another terrace in the middle of the place. We went straight to the middle terrace which was very well lit and quite cozy with a capacity of just under 20 seats. The place itself is very nice with lots of dark wood and that pub vibe to it while still being clean and proper. There was plenty of space early on but began to fill up later on. You do not need to worry about lineups here since the capacity is quite large and the kitchen still gets things moving at a brisk pace. We started off with some morning coffee and white & red eye ($8) which is a beer, tomato juice and vodka with an egg in it. All I have to say is that it has an interesting taste and by interesting I mean, I was not a fan unfortunately. 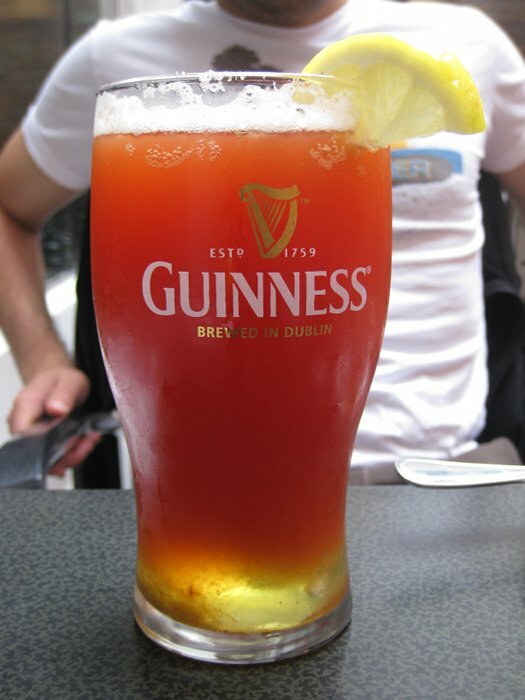 I have a tough stomach and having eggs in a drink is not foreign to me, it’s just the tomato juice and beer with vodka that did not work. Thankfully the waitress checked up on us and when she saw that we did not like it she swapped it for another drink free of charge which was really nice of them. I ended up having a bloody Caesar which was quite good and oddly enough, a decent morning drink. 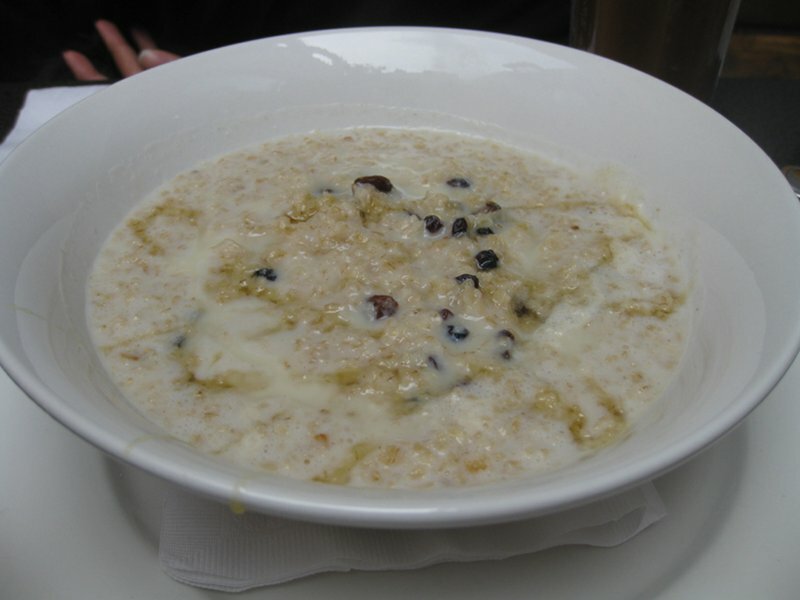 For the food, we started off with a porridge ($5) which, although does not seem like a brunch dish, it was actually quite interesting. The portion was large and it had raisins, syrup and English cream in it. I did not notice the English cream taste which is a good thing since I am not a fan. For $5 you cannot go wrong with this. You get a good sized plate of filling porridge and the best part is that it’s not too cold, not too hot, but just right (sorry I couldn’t help using that line). My dish was the full English breakfast ($11) which is your classic, eggs, ham, bean, sausage, blood pudding, bacon, tomato, potatoes and mushrooms. This dish was very filling and well priced to boot. The bacon was a short piece but it was really thick and the taste was spectacular. I wish the piece was bigger so I could have had more. The potatoes were some of the best I have had in a while and I was very impressed. The sausage they had was not a classic sausage you would get at most places serving English breakfast but it was somewhat spiced and 100% tasty. Our waitress and hostess were both really nice; they were very thorough and helpful in explaining the menu, our coffee refills came quickly and I loved the fact that they took my drink, which I had almost drank half of, and replaced it with another at no extra charge. Good job on the customer service! There are a few vegetarian options, like the omelette, muffins & marmalade and porridge. The menu itself is not very large so you don’t get tons of options and English breakfasts are not usually associated with vegetarianism or veganism. 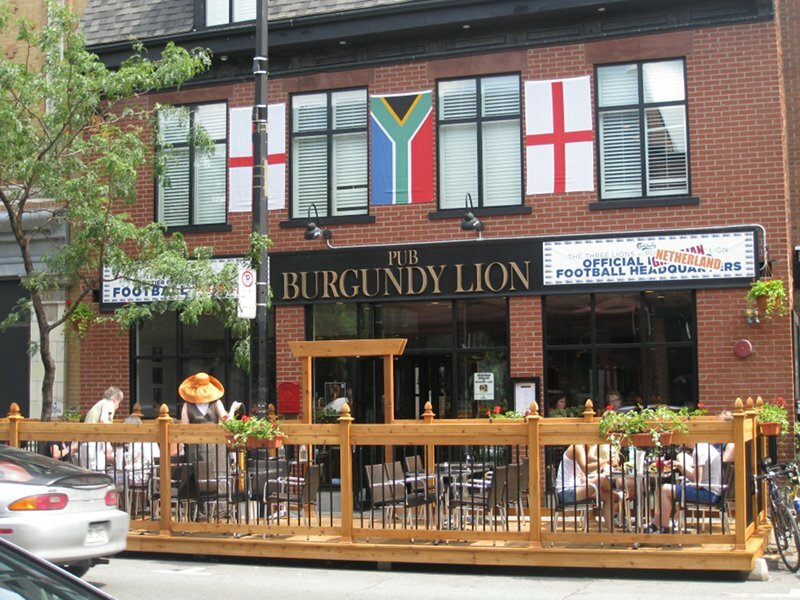 Burgundy lion does a good job offering an English breakfast option at a good price with some twists to it. I enjoyed the food very much. Even though the menu is somewhat limited, it works if you want a pub style brunch. In the end, don’t except vegan tofu scrambles or fancy eggs benedict because you will not find it here. What you will find is hearty tasty food at a decent price. This restaurant has great breakfasts. The Scotch eggs are very unique, the bacon which are chunks and are braised in maple syrup are amazing and unique make this a very delightful experience as you notes; wish that there was more on the plate. The oatmeal is very well done, and I am not a lover of oatmeal. The blood pudding is not quite British; seems like a local boudin which is a little different than the British “black pudding”. The sausage very good and tastes like traditional “bangers”. When i first saw you rated this 3.5 stars, I thought you were a bit too low. But the inconsistency makes your rating a bit more reasonable. I might still tend to give it a 4 star, but why quibble. Do u serve meals at around 3 pm?